There are times when you want to leave a message regarding a place that a later passerby may be able to find and open and perhaps even add a message. 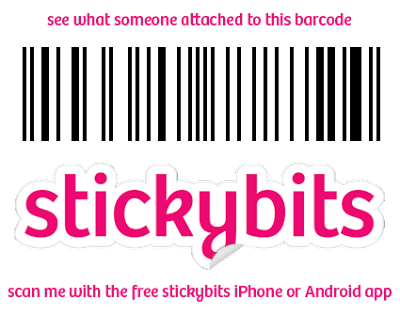 Stickybits now lets anyone with an iPhone or an Android phone scan a barcode and get or leave messages about that barcode. You can try this out by scanning the barcode below. I generated it using the Stickybits website. The code is attached to this blog and is available for you to scan and leave messages for others who have seen and scanned the code and are willing to tell others about it. I love the idea of this. I am concerned that it might be lacking the controls necessary in order to keep it from being abused, but they may well be on to something here. I've had a couple of cool barcode ideas hanging out in the back of my head as well, so maybe this will give me the impetus to bring them out to play as well. This is a technology that didn't make sense until the advent of the smartphone which could be easily programmed to become a bar code scanner. Now there is plenty of compute power and connectivity in the smart phones and our imagination becomes the limiting factor. Stickybit Cacheing -- It's virtual geocaching. Why worry about putting junk in a geocache when you can put virtual stuff in the box. Virtual tours / information stations -- you can add audio / video / downloads by placing the sticker and mounting it near a landmark / lightpole. Scavanger hunt clues -- use the tags as clue stations in a scavenger hunt. The use of red herring clues would be the perfect penalty for advanced players. Access control. This may be as simple as a publish only version of the code. Maybe information that could only be revealed by having a password as well. Let's play with it and see what happens. Scan the code above. Leave me a message.